From 21 to 24 September, Southern Tuscany hosted the traditional Maserati International Rally (MIR), the annual get-together of all the European Maserati Clubs, forming the largest and most prestigious gathering of Trident cars in the world. Launched in 1978 by Maserati, the gathering is an important opportunity for the most loyal collectors of the House of the Trident to meet and is an exclusive chance to compete. The event takes place every year in a different European country and this time it was Italy’s turn. Italy hosted more than 100 collectors from 16 different European nations at some of the most charming and characteristic places in the country. The Maserati Club Italia, the largest Italian association dedicated to Maserati, took care of organising the event and chose the exclusive spa complex “Terme di Saturnia SPA e Golf Resort”, in Saturnia, in the province of Grosseto, as its base. This world-renowned spa town is situated within the beautiful surroundings of the Tuscan hills. 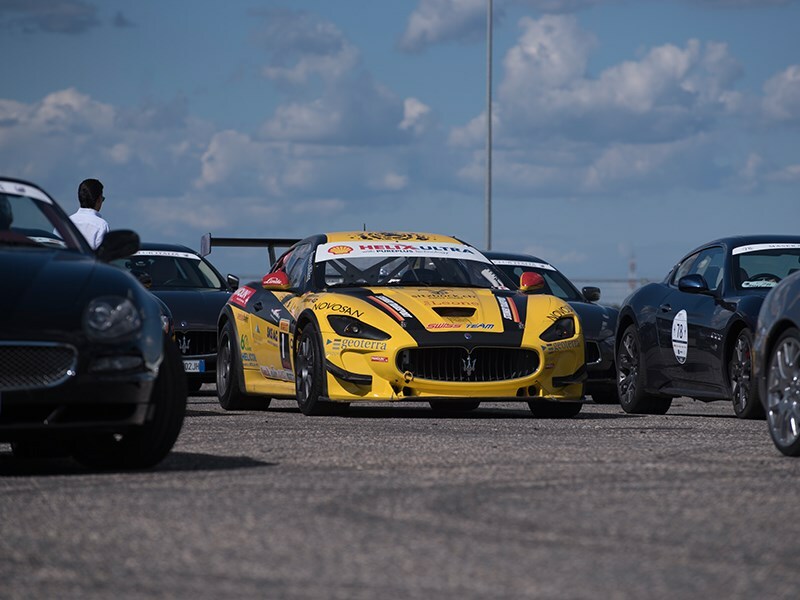 The programme kicked off last Thursday, 21 September, with the participants driving their cars to the Vallelunga racetrack for a racing experience. The following day involved a trip to the charming islands of Giglio and Giannutri, pearls of the Tuscan archipelago. Saturday was also spent in the driving seat, with a picturesque Maserati tour of the “Città del Tufo” (Tuff cities) through Pitigliano, Sovana and Sorano, before coming to the beautiful city of Orvieto, where the Trident cars lined up opposite the Cathedral, a masterpiece of Gothic architecture. On the third day, during the Gala dinner participants were presented with the various awards they had won over the previous days. One of the most prestigious prizes is without doubt the “Peter Martin’s Cup”, named after Peter Martin, one of the first members of Maserati Club UK and owner of an incredible 250F in which he loved to compete. In 1978 he decided to introduce a new trophy named after him and for almost 40 years it has been awarded to the team that wins the most points in the various races during the rally. In 2017 this much-coveted trophy was won by Claudio Mosconi from Ticino whose 3500 GT Spyder also picked up the “Best in Show” award at the Concours d’Élégance. As well as the cup, the overall winner also received a Bulgari Octo “Special Edition Maserati” watch, a chronograph produced in a limited edition series of just 1914 pieces which was made available by Bulgari, Official Timekeeper of the event. The runner-up, Italy’s Antonino Ricciardello in a 2007 GranSport, was presented with an exclusive Montante for Maserati bicycle. Inspired by the most famous single-seater in the world, the Maserati 8CTF, only 200 of these bicycles were manufactured. Ricciardello’s GranSport also won the Modern category in the Concours d’Élégance. Third place went to another Italian, Daniele Bossi, in a 1994 Ghibli, who also received a 1:8 scale model of a Maserati 250F Silverstone. The Concours d’Élégance also included prizes for a 1970 Mexico 4700 belonging to German Rolf Schiemenz (Classic category), a 1972 Indy 4700 America belonging to Briton Michael Roberts (Post-Classic) and a 1992 Shamal owned by Fausto Alberghina (Biturbo and derivates). The winners of the various races also received prizes: Italy’s Daniele Bossi in the 1994 Ghibli (in the regularity competition), Scotland’s Norman and Katrina Geddes in a Spyder cambiocorsa (the team that came from furthest afield), and the Dutch pair Cornis Filius, in a Spyder 90th Anniversary (Rally Quiz), and Coreille Harms, in a Spyder 90th Anniversary (“Maria Teresa De Filippis” award for female drivers). All the cars were meticulously examined by a highly qualified jury comprising Adolfo Orsi, one of the most authoritative vintage car experts in the world, Ermanno Cozza, curator of the Maserati historic archive, Fabio Collina, head of Maserati Classic, and Claudio Ivaldi, Manager of Maserati Club Italia. Among the participating cars there was also a great deal of appreciation for an OSCA MT4, a 1950s barchetta sports car constructed by the Maserati brothers during their second automotive adventure, belonging to Dutchman Marcel Lammeree, who received a special prize from the jury during the Concours d’Élégance; two 3500 GT Spyders, one of which a pre-series model that was exhibited at the Geneva Motor Show of 1959, and three Ghibli Spyders, including a very rare “SS” version. Also present was a 1967 Quattroporte that was transformed into a fire prevention vehicle and used by the “Lions” of the CEA at Italian racetracks, which came fourth in the Peter Martin’s Cup. Another of the cars on the track at Vallelunga was a GranTurismo MC GT3, a race car derived from the GranTurismo coupé which, with 12 examples present in its various versions, was the most represented Trident model at this Italian edition of the Maserati International Rally, during which Maserati exhibited its entire MY18 range with the Ghibli and Quattroporte sedans, the Levante SUV and the GranTurismo and GranCabrio sports cars. The final act of the 4-day tour was the “Butteri” show in the Tuscan Maremma, which was preceded by a ceremony acknowledging the foreign chairmen and a presentation of the programme for MIR 2018, which will take place in Berlin.